This was a night of great Celtic music, lively talk and much humor. Our guests in Studio A were Celtic guitarist John Brennan and seven-time All-Ireland button accordionist John Whelan. The two have joined for concerts together here in Connecticut and will be playing with renowned fiddler Kevin Burke in nearby Westport a week after this show. 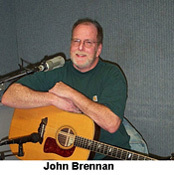 John Brennan became involved in Celtic music only 2½ years ago upon moving to Connecticut from the West Coast. In California, he split his time between being a studio musician and touring with groups like POCO, Graham Nash and Chris Hillman. He’s creating his own genre, “California Irish music, which uses traditional American instruments such as slide guitar and dobro to approach Celtic music. 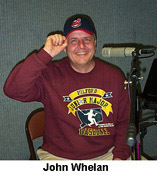 John Whelan has been a frequent visitor to Profiles in Folks, so much so that we consider him the leader of our house band. He is one of the world’s finest button accordionists and a great conversationalist as well. Catch his imitations of Kevin Burke during this show. Bodhran player Stu Speer of the Shamrogues accompanied Brennan and Whelan on most of the live pieces. WSHU Chief Engineer Paul Litwinovich once again worked his magic at the sound board.